Gary Busey made his film debut in Angels Hard As They Come, a low-budget 1971 hippies vs. bikers saga, with Busey as a hippie and Scott Glenn as one of the "big men with throbbing machines". For several years Busey worked in obscure films and low-profile appearances on TV series, including playing the last man killed in the final episode of the long-running western Gunsmoke. He also worked as a musician, playing drums in several struggling bands, and on Leon Russell's 1975 album Will O'the Wisp. He was nominated for an Oscar as the title character in The Buddy Holly Story (1978), but he has since drifted through numerous lesser roles, and is often typecast as a sneering villain. He played the assassin "Mr. Joshua" in the original Lethal Weapon with Mel Gibson and Danny Glover, and the maniacal Naval officer in Under Siege with Steven Seagal. Busey starred in the surf movie Big Wednesday with Jan-Michael Vincent and William Katt, and years later played an FBI agent in the surf-heist film Point Break with Keanu Reeves and Patrick Swayze. He has also had success in supporting roles in offbeat films, including Terry Gilliam's Fear and Loathing in Las Vegas with Johnny Depp, and David Lynch's Lost Highway with Bill Pullman and Patricia Arquette. In 1988, Busey suffered severe skull fractures in a motorcycle accident. He had not been wearing a helmet, and at first doctors feared that he had suffered permanent brain damage. When Busey eventually recovered, he vividly described leaving his body after hitting the curb at 45 miles per hour, and being lectured by angels who spoke in thought with androgynous voices. After he was discharged from the hospital, Busey spoke out against rules requiring motorcycle helmets be worn and said he would continue to ride without wearing a helmet. He has since reversed his position on helmets. In 1997, after recurring nosebleeds, he underwent surgery to remove a golf-ball-sized cancerous tumor from his sinus cavity, and after surgery he underwent radiation therapy. Also in 1997, Busey starred in a CBS pilot for a revival of Hawaii Five-O, produced by Stephen J. Cannell and featuring James MacArthur -- 'Dano' from the original series. The finished project, however, was reportedly so wretched that the network never aired it. 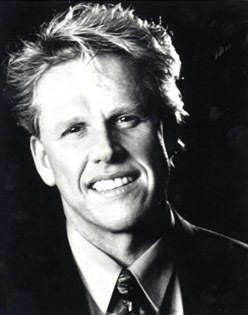 In 2003, Busey starred in a faux reality series titled I'm with Busey, wherein he shared time and space with his greatest fan, Adam De La Peña. Busey was later featured in the celebrity reality show Celebrity Fit Club, wherein the once-famous, Willie Aames and Victoria Jackson among them, sought to lose weight. In 2004, Busey was briefly jailed when he arrived an hour and a half late for a spousal support hearing. He also made news that year when his refused to pay $6,000/month rent on his Malibu home, claiming that he was having problems breathing, brought on by dust in the air vents. Busey's landlord eventually agreed to clean the vents, and Busey paid his past-due rent. In 2006, Busey starred in a Turkish movie, Kurtlar vadisi: Irak or Valley of the Wolves: Iraq. An action film that drew large, enthusiastic audiences in Germany and Middle Eastern nations, the movie was widely perceived by Americans (who hadn't seen it) as anti-American and anti-Semitic. Busey was criticized for his role as a Jewish-American doctor harvesting kidneys, corneas, and other human organs from Muslim prisoners at Iraq's infamous Abu Ghraib prison, then selling these organs to patients in America, Israel, and England. Busey's agent was quoted as saying it was "just a paycheck" to the actor. Interview with Busey, Christian Walk: "And then I went to the Promise Keepers after that, after my felony was dismissed, and I rededicated my life to Christ. And Bishop Wellington Boone was there, and I met him after the meeting, and I said, 'I want to do this', and he said, 'You'll reach a lot of people because of what you do.' And my first Promise Keeper meeting I spoke at I had a chance to sit-down with Coach McCartney. This man is filled with love, treasure and intensity. And I'm not usually at a loss for words, but sitting with Coach McCartney, I was all ears and all heart. I was opened up in every way. I felt like a child. And I felt truly like a child of God, which we all are."